The former Allenby Theatre at 1213 Danforth Avenue. 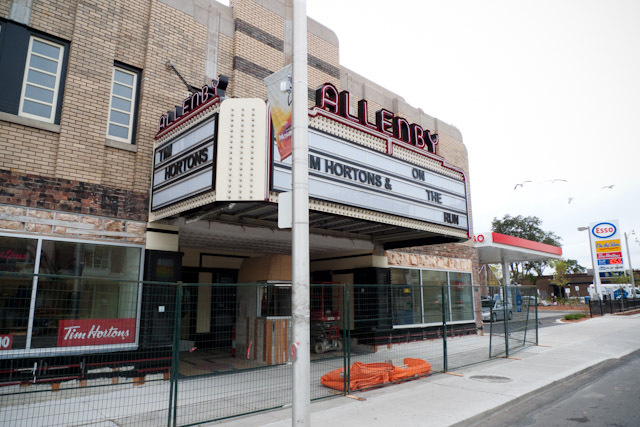 Customers in line at the recently opened Tim Hortons located in the gutted interior of the former Allenby Theatre [PDF] would be hard-pressed to imagine that for a time, the site was the Toronto epicentre of a North American movie craze. This occurred back in the mid-1970s, when the Allenby was known as the Roxy, the fetishistically bizarre Rocky Horror Picture Show was screening to capacity crowds in full costume, and Tim Hortons, with franchises numbering less than a hundred, was nothing more than a donut shop lightweight. From a film fetish to a coffee fetish, the recent Allenby Theatre–Tim Hortons transformation reflects the changing face of a community. 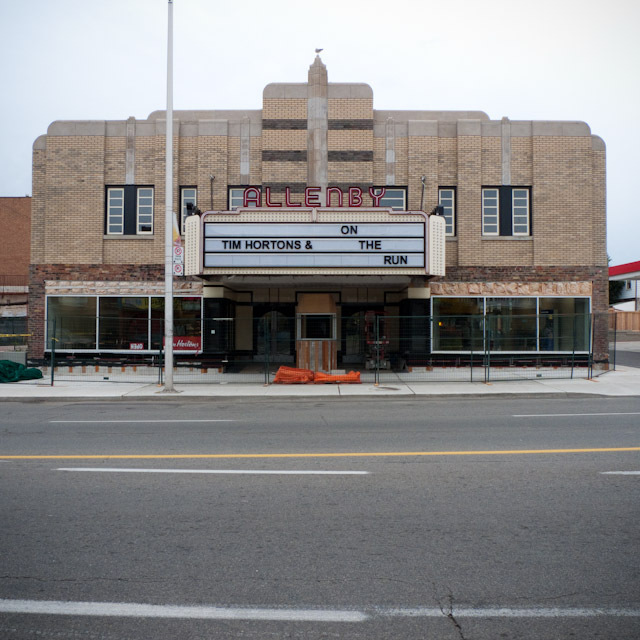 For the most part, all that remains of the original Allenby Theatre at 1213 Danforth Avenue are the interior and exterior lobbies and the building’s facade. Everything, including most of the original marquee, the ticket booth, the seven-hundred-seat auditorium, the projectionist’s cubbyhole, and the entire second floor, which included an apartment, has been razed. Tim Hortons shares the site with an On The Run convenience store and Esso gas bar. Since 2006, the architectural firm ERA has been overseeing the restoration and adaptive reuse of the structure. The work itself is being carried out by Heritage Restoration Inc. This detailed undertaking has seen the re-establishment of a gas station to the west of the former theatre, as well as the demolition of the structure immediately east of the cinema. More than three-fourths of movie houses constructed in Canada between 1919 and 1950 were designed by the architectural firm Kaplan and Sprachman. Many neighbourhood theatres constructed during the Depression were completed in haste, with emphasis placed on the bottom line rather than quality workmanship. This included the Allenby, which opened in 1935, and which ERA staff discovered—upon giving the building a thorough once-over before commencing the refurbishing project—was poorly constructed. In 1970, Mike Andrikopoulos, current owner of the Danforth Music Hall, purchased the Allenby. By this time, neighbourhood theatres had hit their zenith. For a brief time, before renaming it the Roxy, the theatre was known as the Apollo, specializing in the screening of Greek films. Soon after, the Roxy became a repertory theatre, charging 99¢ admission. During the mid-70s, the Roxy gained a reputation for its technical accoutrements. Beginning in 1976 when Jon Lidolt was hired to run the Roxy, the theatre experienced a renaissance. 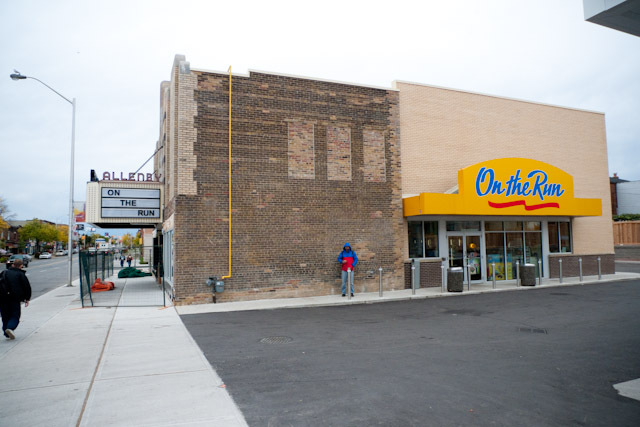 Realizing the Roxy’s potential, Lidolt undertook a complete redo of the building. Well versed in the technological advancements of the day, Lidolt convinced the owner to install a first-rate sound system. The theatre was one of the first cinemas in Canada to boast an optical Dolby Stereo sound system. In order to project films in their correct screen ratio, a forty-foot screen was installed. Though the theatre and sound system had been spruced up, it was what Lidolt’s projectionist put onto the screen that proved to have the most significant impact on the cultural zeitgeist of the time. Lidolt first conceived the idea of screening The Rocky Horror Picture Show, unaware of its burgeoning cult status and its accompanying theatrics. Initially, Lidolt noted a handful of patrons attending the film arriving in costume. That was when Lidolt struck on a genius idea. He suggested staff dress up as characters from the film as well. At first, staff were reluctant. Soon, however, with patrons dancing in the aisles to the “Time Warp,” staff, now blending in with moviegoers, were able to keep an eye on the exuberant crowd. The Roxy was in the vanguard of the Rocky Horror Picture Show cult frenzy that swept the continent. The other culturally significant film screened at the Roxy during this time was Led Zeppelin’s 1976 release, The Song Remains The Same. On evenings of the Zeppelin screening, a different crowd entirely filled the auditorium. No Dr. Frank-N-Furter corsets or rice, toast, and water guns here. These evenings, things mellowed. When Jimmy Page played a blistering solo during the Led Zeppelin anthem “Stairway To Heaven” on his red, double-necked Gibson electric guitar, the marijuana smoke wafting through the theatre was so dense patrons caught a buzz off fumes alone. Eventually, the Rocky Horror Picture Show craze (mostly) ended. The theatre’s best days were now firmly in the past. Andrikopoulos sold the Roxy in 1987. New owners made a failed attempt to convert the building into a reception and dance hall. Earlier this decade, the theatre was closed and boarded up permanently. Likely, if the theatre’s façade had not been designated historically significant by the city and listed on the inventory of heritage properties in 1985, the entire structure would have been razed. According to Chris Huntley at Heritage Restoration Inc., the façade’s finishing touches should be complete by November 15. In recognition of the building’s past, Heritage Toronto will install a plaque on the property.